In this article we will learn how to search data from table without hitting front-end and back-end (means without hit database or server side code). For search the records from an entire page there are two ways for do it. For search the specific records we will send the request using ajax method and search the records from database then result will be shown.And another method is that we will store all the records in any collection like DataSet or Session or any other variable and use LINQ for filter it. Now all these ways will take long time and always post your page which your application will running very slow because here are the two reasons first post your page on server side, if huge amount of data. 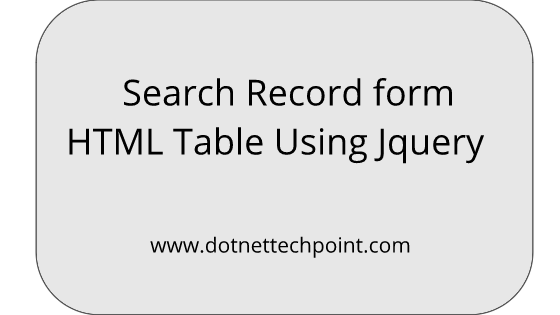 For solve this issue we will search data from Jquery in HTML Table. Here is the idea and this idea’s will not post the page on server side and not hit database. To search the records using Jquery. Open Visual Studio-> Create new project which is "SearchRecords". After click on OK button below dialog box will be open and then select empty template and then click on OK button. Now after click on OK button our project is created successfully and then we add a new web page which you can see below screen-shot. After click on OK button our project is created. Now I will add GridView control for bind the records. And create an input control for enter search value. Now I will fetch the records from this method. After got the total record I will bind it in our gridview which is "searchGridview". After successfully bind the record in gridview show like. Now when we enter any values for search in above input box. We will search record without page post and without hitting on server-side we will use jquery on keyup event for search very fast. Cancel the search value if user press backspace or ESC key. Below code will shown jquery to have a : Contains selector which is case in sensitive, the :contains selector remains unchanged. Now here is the full code of client side you can use it. Conclusion: In this article we have learnt that how to search records from HTML Table without post a page or without hit server and database.